Oriental rugs come in a variety of designs, shapes and sizes, yet they often have one thing in common – the way they are created. Ahdoot Oriental Rugs wants to offer you some insight into the different elements which come together to make a rug, hopefully helping those who might consider themselves amateurs in Oriental rugs gain an understanding of the beauty and artisanship involved in their manufacture. First, it’s important to know first-hand about the tools utilized by the weavers of Oriental rugs, as their design and quality play a tremendous role in the quality of the rug itself. Scissors: Often called appliqué scissors, these hefty tools are used to clean and sculpt a rug, as well as its threads, throughout the manufacturing process. At times, they are also used for scraping a rug to get all of the loose ends out of the carpet’s pile in order for the rug to have a smooth finish. A weaver’s scissors are intentionally bent at a slight angle so the blades are able to make their cut flush with the face of a rug. Hooked knives: The second set of instruments are sometimes known as qulabs, or hooked knives, which are not only useful in pulling the yarn or thread behind the warps to the face of the rug, but also serve a second purpose of cutting the yarn once it has been threaded through. The same is true of the small, handheld hooking tool shown at the bottom of the image, which is used to clasp finer pieces of thread during a rug’s construction. Comb: Once several rows of knots have been positioned across a rug, weavers use the comb (also known as a beater) to fuse the threads together into the anticipated design. Next, we’ll cover a few of the important aspects of the apparatus upon which Oriental rugs are produced, though it should be noted that there are a number of ways rugs and carpets around the world are being put together currently. However, hand-woven rugs typically come from this type of loom (vertical loom), which is part of the reason why they are highly-valued among collectors for the painstaking process involved in their creation. Upper and Lower Beams: The weft of a rug is attached to these beams and through which the warp is woven to form the foundation of the rug itself. Heddle: The heddle serves as the separator between the warp threads in order for the weft to be passed through more easily for the weaver. Shuttle: These are tools specifically designed to carry a weaver’s threads across the loom during the weaving process, and are typically made from narrow pieces of wood notched so that the weft yarn can remain attached. Edge Binding and Edge Selvedge: The edge binding and selvedge join the edges of a carpet to protect them from wear and unraveling. Lastly, we will inspect the various components which are commonly part of a finished Oriental rug. Some are self-explanatory, while others are important when describing certain areas of the article. And though there are exceptions to these design elements found in rugs made around the world, many of these characteristics are present in nearly every rug. Fringe: A rug’s fringe is comprised of an extension of the warp on either the vertical portion of the rug, or on all four sides. Edge: The edge of a rug is where the field comes up to a rug’s borders, though it is sometimes used to describe the edge of the rug itself. Border: There are typically three parts that come together to form the border. The outer border sits closest to the outer portion of the rug and is part of the overall design, the inner border lies next to the field’s edge, and the main border is that segment settled between the inner and outer borders. However, sometimes when describing a rug, people will only use the term “border” to illustrate all three of these components. It should also be noted that the guard border is placed just outside of the outer border and is essentially part of the edge of the rug, helping it to maintain the design should it become unraveled and need to be restored. Field: The field is the entire area of the rug lying between its border, containing the medallion, corner brackets (spandrels), and any other elements of the inner design of the carpet. Medallion: Medallions are the center design of the carpet, usually a round, oval, or polygonal design that is the centerpiece of the rug, and its main feature. With this information, you can now discuss these topics at greater length, and have an even greater understanding of how the art of weaving comes together into the complex symmetry of an Oriental rug. 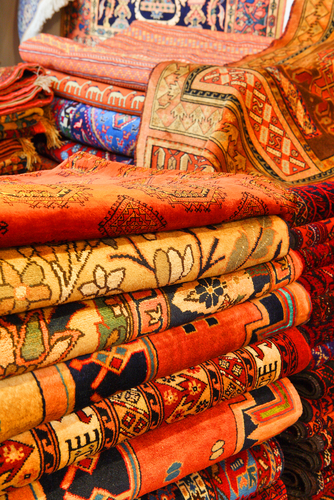 Want to discuss your own piece with one of our Oriental rug experts? Not only do we offer appraisals, but we also provide cleaning and restoration services in our store. Contact us today to find out more about how we can help you.